A dark orange sheet of paper was inserted in the December 2003 issue of History of Anthropology Newsletter (HAN), containing the following headline: ‘Regime Change at HAN’. The short text briefly mentioned the new editor and her publications without any editorial statement. Does this mean that the history of anthropology was by 2003 an established domain of research and consequently that HAN no longer needed to justify itself? To what extent did the absence of an editorial statement signal a sort of implicit recognition that the field had been ‘occupied’ by historians of science, and that the transition (not entirely smooth) from intellectual history to history of science had taken place between 1973 and 2003? Or was it the acknowledgement that the ‘Problems’ raised by the 1973 statement were no longer thorny issues? It is not irrelevant that the most crucial theoretical and methodological debates surrounding the emergence of the history of anthropology in general and of HAN in particular—presentism versus historicism, whether history of anthropology could be considered as a sub-discipline within anthropology or as a specific ‘field of historical inquiry’—were conducted in the very first issues of the Journal of the History of the Behavioral Sciences, created in 1965. The dilemmas that permeated the history of anthropology at that time—was it to be a disciplinary history or part of more general histories?—mirrored the debates on the epistemic status of anthropology itself (caught as it was between the social and the human sciences) and its blurred disciplinary boundaries—in short the debates on the nature of the discipline as an autonomous field of inquiry. Image reproduced with permission from Jean Jamin. As long as anthropology is the frame of reference for the history of anthropology, its quandaries and predicaments—is it a ‘science’ or a ‘study’ of humans?—affect the ways in which its history is written. The very term ‘history of anthropology’ has been open to question; the use of the plural, histories of anthropology, and a new accretion, history of anthropology and ethnology, have emerged to suggest the pluralism of approaches within both anthropology and its history, as well as the specificities of different national traditions beyond the English-speaking world. 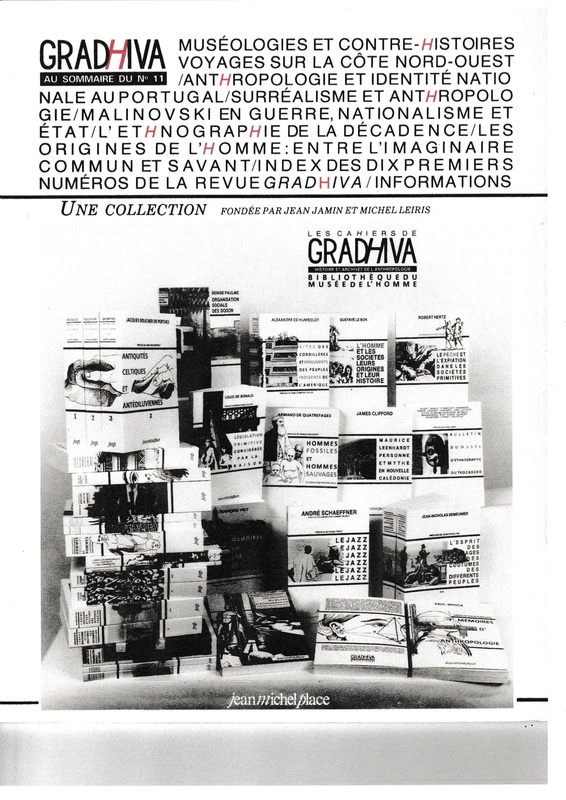 Interestingly, in 2005, at the same time as this shift was taking place, the first French journal dedicated to the field, Gradhiva, Revue d’histoire et d’archives de l’anthropologie, whose foundation in 1986 had been greatly welcomed by HAN, became Gradhiva, Revue d’anthropologie et d’histoire des arts, a change that underscores the connections between anthropology and the humanities. It remains to be seen just how the objects of the history of anthropology will rest on definitions of the discipline which come from within anthropology itself. It remains also to be seen how far the history of anthropology, by focusing on material and epistemic practices, will leave aside its traditional frame of reference and come into dialogue with the history of other disciplines. Nélia Dias, “A History Set Free From Its Object?,” History of Anthropology Newsletter 41 (2017): http://histanthro.org/notes/a-history-set-free-from-its-object/.